Attention all bicycle riders! Light up the night! On December 21, 5:30 pm, meet at Pliny Park in Brattleboro. 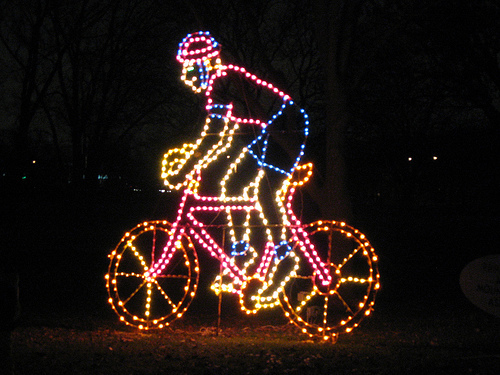 Deck out your bike to outshine the holiday lights in Brattleboro. Ride south on Main St, south on Canal, RT on Fairview, LT on Maple, RT on Guilford Extension past Living Memorial Park, RT on Western Ave, back to downtown. Followed by social at a downtown location. Spread the word. Please contact Alice Charkes (acharkes@myfairpoint.net) for info. This entry was posted in bicycling and tagged bicycle ride, light up the night. Bookmark the permalink.